Although we eat a variety of different vegetables, and eat a lot of them each and every week, I will always have a special place in my heart (and stomach) for eggplant. I am not sure why, but I simply love how a simple eggplant can change its texture so easily and be used in so many ways. One day I was craving eggplant parmesan, and since I had two nice eggplants and a handful of large, ripe tomatoes that I really had to use up, this dish was born. 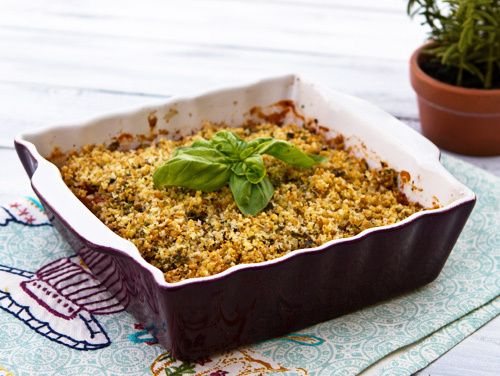 Although similar to an eggplant parm in that eggplant is layered in a casserole dish, I used very little cheese in the dish to keep it light, and topped the dish with a seasoned wholewheat breadcrumb top. I have made this dish a few times now, and it is a wonderful light lunch option, or a nice vegetable side dish for roasted or grilled meat. I did find that the dish could be a little dry though depending on the tomatoes I used, so I began to add a little chopped canned tomatoes along with the sliced fresh tomatoes and it is now exactly right. This is one of those dishes you can play around with depending on what you have on hand, and add some sauteed onions, zucchini, or mushrooms into the layers if you desired. If you are not living in an area where you can find really nice, ripe, fresh tomatoes, feel free to use all canned tomatoes. Simply double the amount of canned tomatoes I use in the recipe and lightly cover each layer of eggplant with the chopped tomatoes. To cook my eggplant, I always grill them or brown them under the broiler rather than frying them to keep the dish healthy and light. If you have olive oil spray available, it is a great way to cut down on the oil used to cook the eggplant. Simply spritz each side of the eggplant slices before broiling or grilling them. In addition to featuring a host of vitamins and minerals, eggplant also contains important phytonutrients, many which have antioxidant activity. Tomatoes used in the sauce are rich in Lycopene, vitamin C, potassium, iron, and fiber. 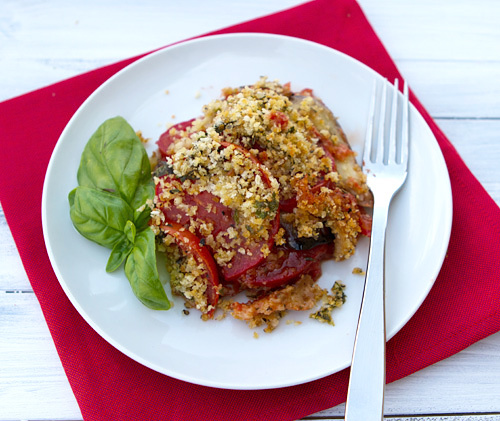 Compared to traditional eggplant parmesan recipes, this dish is much lighter in flavor and calories from fat since the eggplant slices are either broiled or grilled rather than being fried. Using wholegrain breadcrumbs instead of regular white breadcrumbs adds nutritional value to this dish. 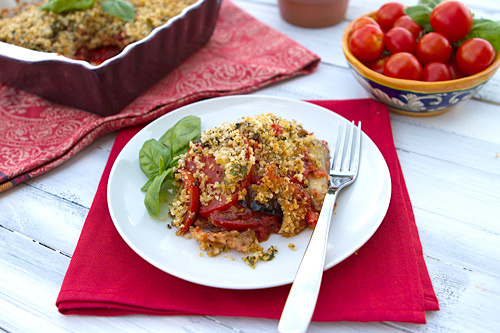 Similar in flavor to eggplant parmesan with half the calories! Preheat the oven broiler and line a baking sheet with aluminum foil. Remove the top and tail from each eggplant, then slice crosswise in 1/2 inch slices. Lightly spray the foil with olive oil spray on the baking sheet and lay the eggplant slices side by side. Lightly spray the top of the slices with a little olive oil, then broil until softened and beginning to brown. Turn the slices over and continue to cook the rest in the same manner. In a bowl, mix the chopped tomatoes, garlic, two teaspoons of olive oil, and basil. Mix well, then season with salt and pepper. Preheat oven to 375 degrees F. and lightly oil an 8 or 9 inch oven-proof casserole. Use a large spoon to ladle a good sized spoonful of the chopped tomatoes on the bottom of the casserole dish and spread evenly across the bottom. Begin to lay the eggplant slices on top of the chopped tomatoes, overlapping them slightly, until you have covered the tomatoes. Place a layer of the sliced tomatoes in the same manner on top of the eggplant, and use a tablespoon to add a few dollops of the chopped tomato mixture on top of them. Sprinkle with a little of the grated parmesan, and then complete the eggplant and tomato layer once more, using the rest of the chopped tomato mixture to cover the top. Mix together the crumb topping ingredients, rubbling in the oil. Sprinkle the crumb mixture across the top of the casserole. Cover with aluminum foil and bake 20 to 25 minutes or until bubbly. Remove the foil and continue to cook an additional 15 minutes or until the crumb mixture is golden brown. Let rest at room temperature 15 minutes before serving.